At Nova Montessori School we affirm that the philosophical foundation of the Montessori approach is based on the premise that education is an aid to life. Respect for the children’s personality and trust in their inner potentialities are prerequisite to the establishment of a healthy learning ambiance. 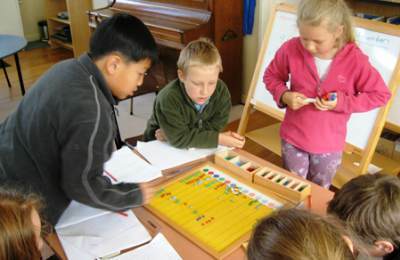 Montessori identifies the goal of education as the development of a complete human being, oriented to the environment, and adapted to his or her time, place and culture. Today we extend this by asking the children to question deeply in order develop personal integrity so they are ready to meet whatever life may bring. Teachers at Nova Montessori emphasise humanity’s responsibility to the Earth community. This form of learning enables children to see the whole in order to understand the details. It emphasises the need to integrate the curriculum – from mathematics to language, history, geography as well as the sciences: geology, zoology, botany, physics and chemistry and the newest field of Earth systems science. Art, music, drama and dance are blended into the curriculum as expressions of human creativity. The Montessori approach to life and learning combines freedom with responsibility, a more active role for the children in their learning and academic excellence based on each person’s potential contribution. It also provides for social and moral awareness as well as the development of the whole personality. This is integral to Nova’s vision. Nova Montessori Center Charitable Trust, a self-sustaining organisation, operates Nova Montessori School and The Institute for Montessori Education, a centre for teacher training and development. Prospective parents complete an online expression of interest. The Nova Enrolment Coordinator then organises an observation morning. Depending on age and space available, children may be placed into a waiting pool and contacted closer to the time the children start. Prior to matriculation, interviews and observations are organised with parents and children.